Astronomers always say that our Milky Way Galaxy is long due for supernova – a violent stellar explosion when a star much more massive than our Sun dies, or when a white dwarf pile up sufficient materials from its stellar companion and causes a runaway nuclear fusion and explode. According to observations of supernovae in other galaxies, astronomers estimated that there should be about three supernovae per century in our galaxy. But the last supernova known in Milky Way was Cassiopeia A, occurred around year 1680. These missing young supernovae may imply that that our understanding of the relationship between supernovae and other galactic processes was in error, meaning the estimation was wrong; or maybe the problem lies in our galaxy – although it appears “normal from the outside”, it may be different from other galaxies in some unknown way. Recently, astronomers from NASA’s Chandra X-ray Observatory and National Radio Astronomy Observatory’s (NRAO) Very Large Array (VLA), have found a supernova remnant as young as only 140 years old, hidden behind a thick veil of gas and dust near the centre of our galaxy. That’s why we have not optically seen this object before. All the gas and dust there made it about a trillion times fainter, in optical light, than an unobscured supernova. This supernova remnant, called G1.9+0.3, can hide itself in optical, but it cannot hide itself in radio and x-ray; radio and x-ray could see through the murk easily. This young supernova remnant is known by an uninteresting name: G1.9+0.3, located about 25,000 light years from us. This is a composite of the radio (blue) and X-ray (orange) images. Credit: Radio (VLA) and X-ray (Chandra). This is not the first time astronomers observe G1.9+0.3. 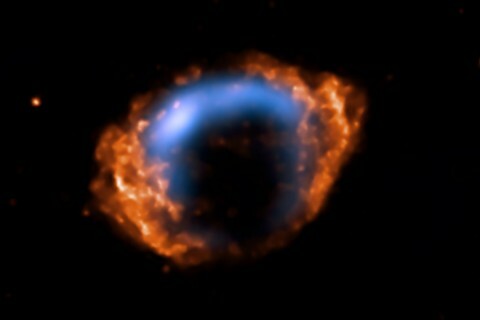 It was identified in 1985 as a supernova remnant, aged between 400 and 1000 years, by using the VLA. 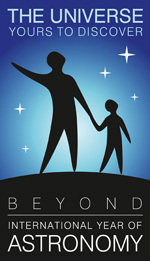 In 2007, another team of astronomers led by Stephen Reynolds observed the object again, this time using the Chandra X-Ray Observatory. 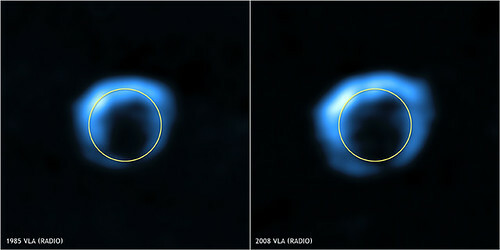 To their surprise, their image showed the object to be about 16 percent larger than in the 1985 VLA image. “This is a huge difference. It means the explosion debris is expanding very quickly, which in turn means the object is much younger than we originally thought,” Reynolds explained. However, this expansion measurement came from comparing a radio image to an X-ray image. To make an “apples to apples” comparison, the scientists sought and were quickly granted observing time on the VLA and their new VLA observations confirmed the supernova remnant’s rapid expansion. But how does the rapid expansion tell us that this remnant is young? We know that G1.9+0.3 expanded 16% in 23 years’ time and by extrapolating that backward to a point, we can find all the expanding stuffs were in one point roughly 144 years ago. This is actually the maximum age – if the initial expansion was faster and was slowing down over time, maybe due to slamming into surrounding materials, G1.9+0.3 may be younger. Now we know that young supernovae do exist in our galaxy, we can be sure that astronomers will look even harder to dig more of them out. ~ by thChieh on May 22, 2008.